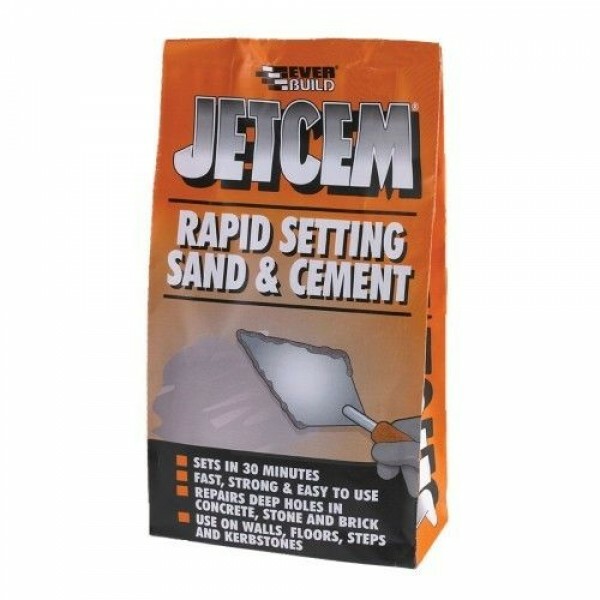 JETCEM is a specially formulated rapid setting cement based patching/repair compound which when mixed with water sets in about 30 minutes. · Rapid setting (30 minutes, depending on ambient temperature and conditions). · Easy mixing, just add water. Internal and external repairs to gaps and cracks and walls and floors. Repairing flags, slabs, stones and bricks. Patching steps and window sills. Jointing earthenware pipes and drains. Repairs to ponds and pools. Setting in W/C’s and sinks. Leak sealing in concrete based surfaces. Before applying, ensure surfaces are clean, sound and free from dust, crumbly material or any contaminants, which may affect adhesion. · Thoroughly wet surfaces to improve adhesion. · Press the cement into the repair with a trowel or filling knife. · Once the product begins to stiffen, throw away the residue. DO NOT ADD FURTHER WATER TO THE MIX. THIS WILL DESTROY STRENGTH. · In warm conditions, cover Jetcem with polythene to assist cure. · Clean tools etc with warm water before Jetcem dries. Store in cool dry conditions between + 5°C and 25°C. Storage outside these parameters will significantly reduce shelf life. 12 months in original unopened bag. This will reduce significantly once opened.